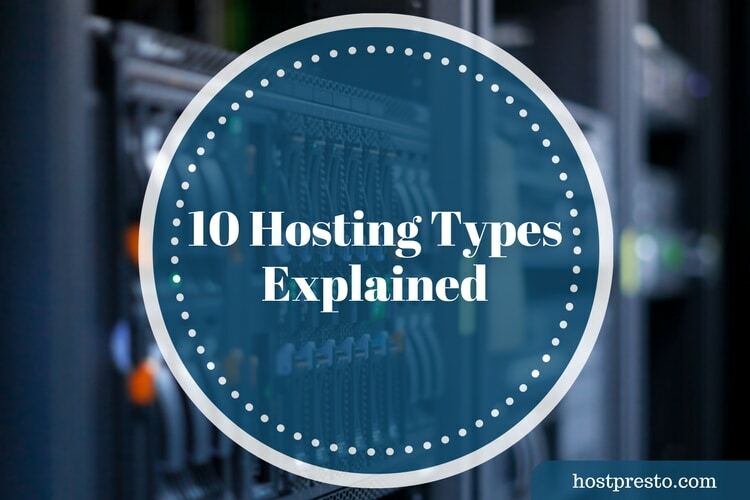 We often get asked here at HostPresto, what are the differences between the various hosting types we offer. On top of that people are keen to know how all of the various plans and packages stack up and what hosting type, plan or package would be best suited to a given customers project at hand. So today, we’re going to run through some of the various web hosting packages we offer here at HostPresto and explain a little bit about what it is, how it works and essentially what it can be used for. This is the most common type of hosting you will come across. It can be used for small to relatively large websites, business or personal. The term shared hosting does not mean your account will be shared with someone, it simply means the resources of the server will be shared, the physical hardware, the bandwidth etc. A typical shared hosting server could host 1000’s of different websites hence the ability for web hosting companies like us to be able to offer such cheap hosting plans. The people who buy reseller hosting tend to fall into two categories. Those who actually want to resell hosting plans and services and those who simply want to host a bunch of their own sites and centrally control them. Typically, each account you create on your reseller plan will have a similar amount of resources to that as a traditional shared hosting plan. However, it will all be centrally controlled by you personally. So if you had a web design client for example and wanted to host their site, you could literally just make them an account yourself and they’d have the full range of features in their plan as they would if they were to go and sign up for a regular shared hosting plan. Less popular these days but there are people out there, often companies who don’t want to bother with a website as such but just want a branded domain name for corporate e-mail and such. Email hosting caters for this distinct group. Typical e-mail hosting plans allow users to setup hundreds of mailboxes (or forwarders) featuring their company domain name. Email hosting is often used to store e-mail remotely so it can be accessed in remote locations as opposed to being simply downloaded to your office PC. Whilst it is true that Wordpress can pretty much be installed on any of the hosting types listed in this article, for optimum performance, a Wordpress optimised hosting plan might be better. Sure, if you’re running a personal blog you will be able to get away with sticking it on a shared hosting plan. But if you’re running something traffic intensive, Wordpress can become a bit slow and cumbersome. Especially if you’re running a lot of plugins. Wordpress optimised hosting plans aim to resolve this and come fully optimised at server level in order to make your site perform at its peak. Dedicated servers, actual physical dedicated servers tend to be only used by extremely high end, traffic intensive websites these days. Most site operators with regular high traffic builds often opt for VPS or Cloud solutions (which we’ve covered below). A dedicated server, as the name suggests is a fully dedicated machine built and configured solely to serve your site(s). All hardware, all resources are at your disposal unlike shared plans where the resources are split between customers. Cloud hosting is one of the most popular hosting types around at the moment. It’s relatively low pricing (in comparison to dedicated options) combined with it’s robust architecture and resource sharing capabilities make it the hosting type of choice for most, experienced webmasters. The easiest way to grasp how cloud hosting works is to imagine an array of 10 computers, all their resources connected and 10 websites hosted on those servers (one on each for arguments sake). If one of those websites were to get a sudden influx of traffic and require more ram, cpu usage or disk space – the cloud setup would allow the site in question to share the resources of the other 9 machines. Then when the usage drops, another site might share the resources of that machine and so on. This is essentially how cloud hosting works but on a much bigger scale. You’re able to use resources from other machines and not be confined to the physical limitations of one piece of hardware as you would be with a dedicated solution. Equally, given you’re not actually tying up hardware permanently, you’re effectively only paying for what you use as opposed to paying for high end CPU’s, ram and disks that you might only use once in a blue moon. Business web hosting can come in many guises. It could be a shared, higher end hosting plan or it could be a VPS/dedicated solution. The choice is yours. Business hosting plans tend to come with more available resources than a typical shared hosting plan. You’ll get many more e-mail accounts, bandwidth and storage space. Some hosts even bolt on analytical programs to help you promote your business. This hosting type is pretty much a web hosting plan optimised for shopping cart/ecommerce store usage. As you may know, the off the shelf shopping cart options such as Magento or WooCommerce can become fairly resource intensive (especially if you have a large amount of traffic). In order to handle this, optimising your hosting plan for a given application type is the way forward. Most ecommerce hosting plans come fully optimised for all of the major ecommerce applications and some, such as ours, even come with one click installer options for all of the common applications. Managed or unmanaged typically refers to VPS or dedicated hosting solutions. As the name suggests, with both of these hosting types you can have an unmanaged or managed service. A managed service is where all aspects of your server configuration and maintenance is handled by the web hosting company. You’ll need something done or you’ll have a server issue, you just put in a ticket and it’s handled. On the flip side, an unmanaged service is the polar opposite. Outside of the initial spin up, all maintenance and handling of your machine will be handled by you personally. With this is mind, if you’re not an experienced server operator you should steer clear of an unmanaged solution. Traditional VPS systems (virtual private servers) tend to have fallen by the wayside in recent years, mainly due to “the cloud”. A virtual private server as the name suggests gives you full control of all aspects of your server as if it were a dedicated machine. You can manage memory, disk space, cpu control and bandwidth quota as you would on a dedicated server but it is actually a virtual environment. One physical computer/server could host multiple VPS machines with the resources evenly split. However, with the advent of cloud technology being confined to the limitations of a physical machine seems almost primitive so hybrid setups, the “Cloud VPS” are proving a better option. Each of the various hosting types above obviously come with more plans and packages within them. A dedicated server for example can be low spec or high spec. A shared hosting account can be setup for one domain or ten domains. You really need to find a type (and plan) that suits your personal situation. You may think shared hosting is the cheapest option but a lower end VPS package might be a better fit than a more expensive, higher end shared hosting package for example. Hopefully the above helps you make an educated and informed decision on which hosting plan is right for you. In addition, if none of the above seem to work for you then get in touch with us as we can also create a bespoke hosting plan just for you!